Saturday, July 27th, 10 a.m. This is always a fun event! Please join us for the annual meeting and club ride to Huddle's Resort on Leech Lake. It's a great chance to go on a nice ride and visit with members who live or have cabins in the area, as well as renew your membership and buy a cap or T-shirt. Ride or trailer your ATV, SxS or OHM to the meeting. It will be about an hour long, with election of board members, trail updates and future club rides/events. After the meeting, saddle up and join the club on an easy 13-mile ride through the Chippewa National Forest to Huddle's Resort in Whipholt for lunch. We're adding a poker run to the ride (cards handed out on the trail)! Enjoy lunch, stay as long as you like and return in groups as desired. Directions to the meeting, from Hackensack: east on Cty Rd 5 for 2.5 miles, north on Cty Rd 122 for 3 miles, road turns west (Stony Drive), go 1.5 miles to Stony Loop and take a right at the Y, watch for signs. 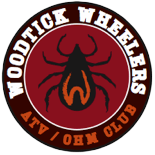 For more club information visit woodtickwheelers.com. Questions: Call Dave at 612-723-1987.